It’s been so unbelievably long since I’ve posted up a Sunday Brunch post! Don’t worry, I haven’t been cheating on brunch – I guess I just haven’t been photographing anything, I’ve been just too busy eating. That has got to change because Sunday Brunch is my ultimate favorite series on this blog. Now that it’s official Autumn, I’m all about the pumpkins and pumpkin spice. Give me all the pumpkin things. Except, not really because I’m not into the weird stuff like pumpkin spice sausage. Pumpkin and sausage is all good, but not pumpkin spice and sausage. This is my go-to pumpkin loaf. I think it tastes surprisingly like the loaf at that mermaid-y green chain where everyone gets their coffee. 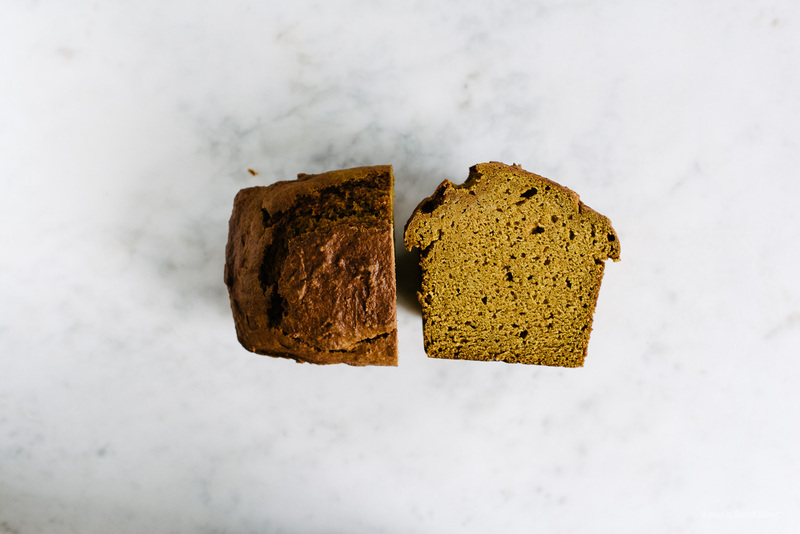 I actually haven’t boughten a slice of pumpkin loaf in the longest time, mostly because I just make a loaf, which lasts me a good while, especially if I don’t do my usual distribution of baked goods. I actually wish there was a place in my neighborhood where I could leave baked goods. I asked Mike once if it was a good idea, but he asked me, “would YOU eat something out of a random box of baked goods you saw on an abandoned picnic table in the park?” Touché Mike, touché. Anyone want some pumpkin loaf? This stuff is dangerous – I’ve eaten almost half the loaf all by myself! Hmm, now that I think about it, I should call up my friend Joanne. She once begged me to make her a loaf after she tried baking this recipe – she said it just didn’t come out the same as mine. 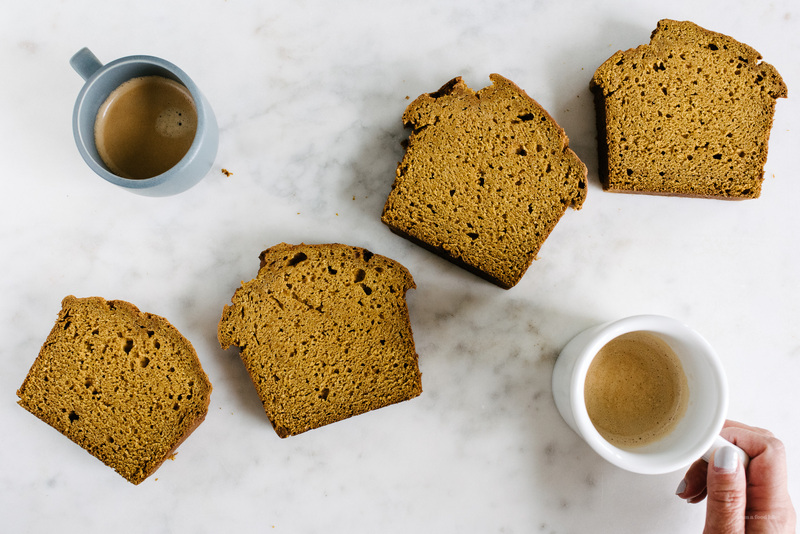 Jo, if you’re reading this, I’ve got pumpkin loaf for you! Okay, truth is, I lied. The loaf’s all gone. Next time? Preheat the oven to 350°F. Butter a 9 x 5 inch loaf pan and set aside. In a medium bowl, whisk together the flour, baking soda, salt, and spices. Set aside. 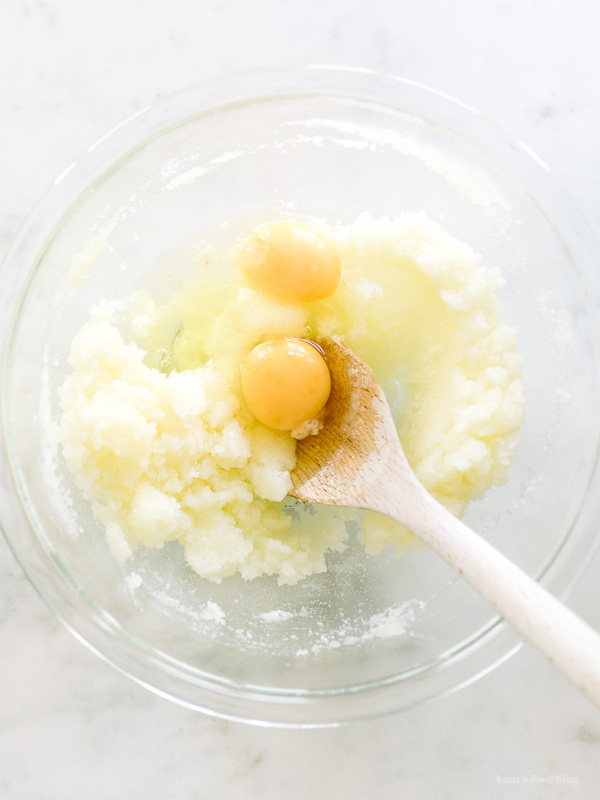 In a large bowl, whisk the melted butter with the sugar. Add the eggs, one at a time, mixing well after each. Stir in the pumpkin until smooth. Add the dry ingredients, mixing gently, until smooth. Pour into the prepared loaf pan, smoothing out the top. Bake for 1 hour and 20 minutes, checking at the hour mark with a wooden skewer – it should come out clean in the center. Tent with foil if the top starts browning too quickly. Remove from the oven, let cool for 20-30 minutes, remove from the pan and let cool completely. Slice and enjoy! sometimes it’s nice to just eat and not document! it’s kind of freeing. 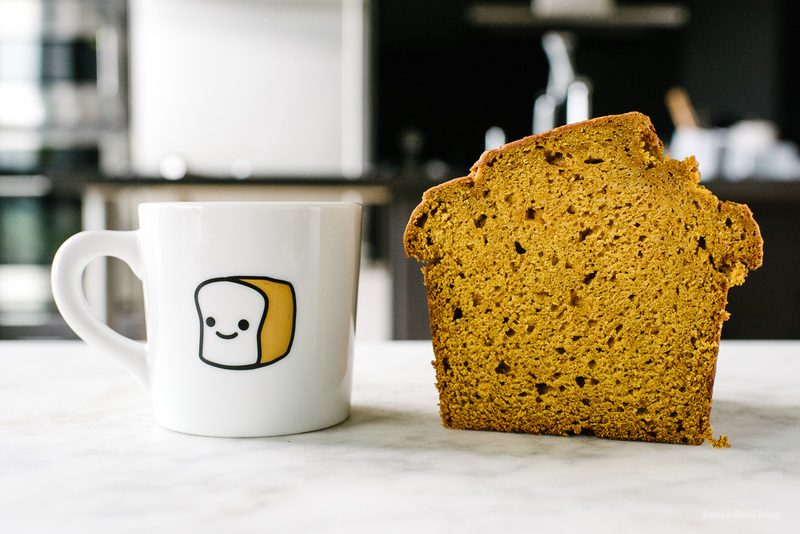 anyways, this pumpkin loaf sounds amazing (i always get suckered into buying a slice at the mermaid lounge), and that toast mug is the cutest thing ever! I’m all for a place where I can leave baked goods as well. I always have too much laying around. Going to try this recipe! Can I please ask where did you get that mug? I need it in my life. Yummy! What a great autumn recipe! yay, brunch is back!!! and making this hot loaf when i get back!! This sounds SUPER delicious! 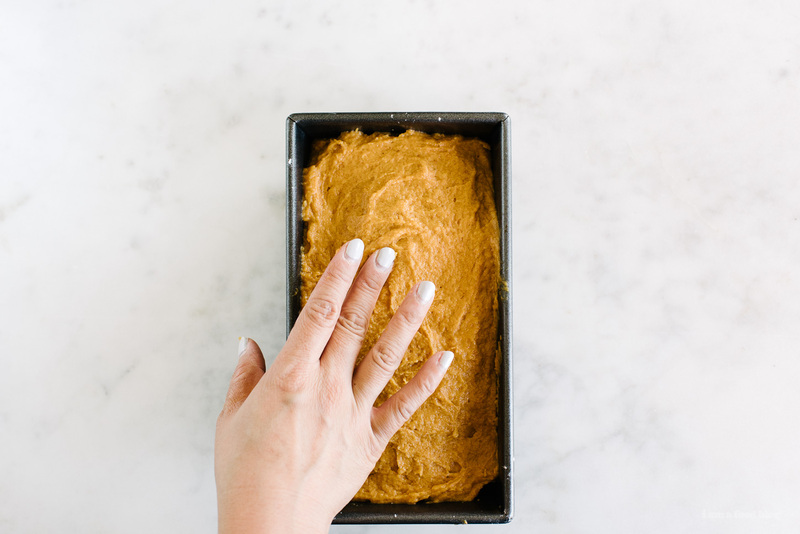 Fall baking is my absolute favorite and also Starbuck’s pumpkin loaf is killer…so this is definitely moving to the top of my list! Food safe regulations prevents accepting a donation of home baked goods, but maybe a friend’s office or workplace nearby? People are always bringing in home baked goods to share at offices! This looks so delicious. I have to try it. This looks delicious!! Where do you buy your loaf pans? I always love how your loaves look and would love to buy some of the pans you use. hi anna! it’s this one! This looks really good. I’ve recently gotten a fresh pumpkin, a really big one. I’m still processing, so nothing will go to waste. 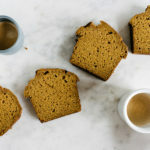 Can you use home made pumpkin puree? 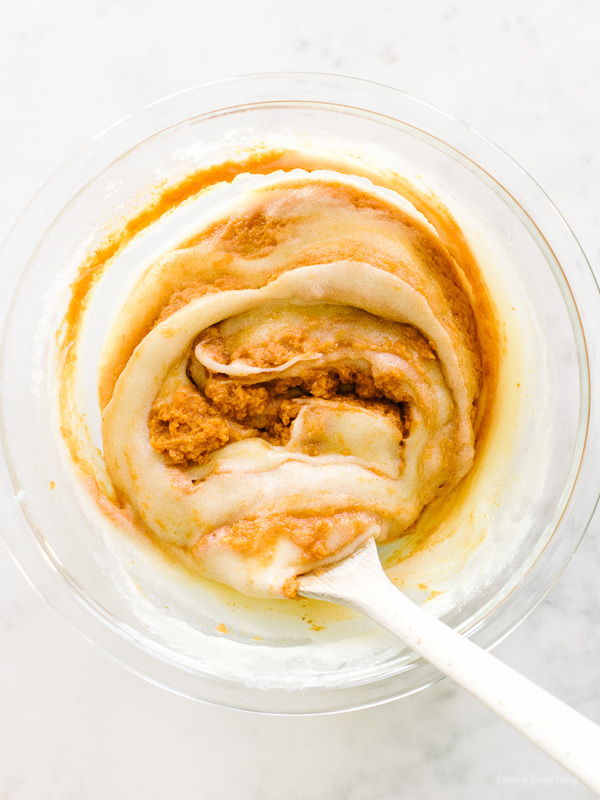 yes, you could definitely use homemade pumpkin puree – just make sure it’s on the drier side! 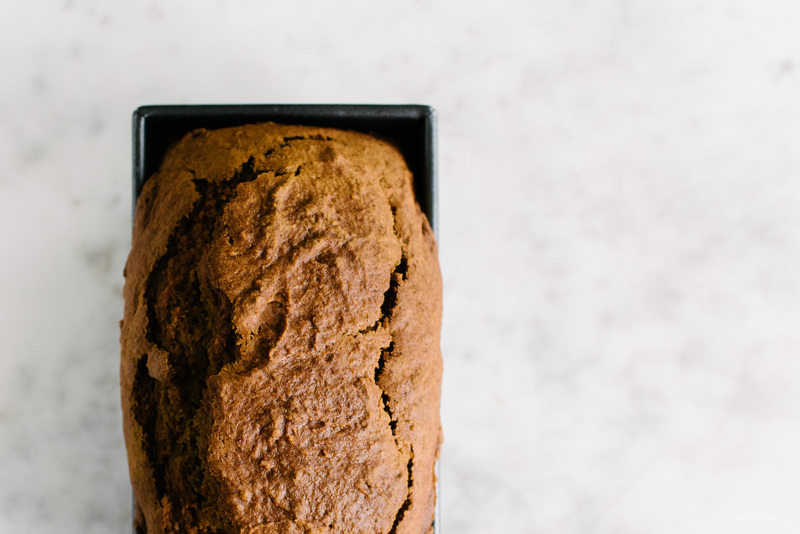 I absolutely LOVE Pumpkin loaf, and this one looks so good! I’m definitely going to have to scribble this recipe down and make it over thanksgiving break! I just found this blog, and I love food and blogging so this may be my new favorite blog! This recipe looked so good and I already had on hand everything required (how often does that happen?!?!) so I made this the day it was first posted. I’ve made it twice since and am now making again tonight. It’s just fabulous. For my oven the foil tent really is needed after 1 hr, and do check for doneness, it goes pretty fast towards the end. Only 2 minor tweaks, I used fresh grated ginger and nutmeg, and also happened to have a lively Vietnamese cinnamon. I can’t wait for breakfast! fresh ginger sounds amazing, i’m definitely going to have to try it! Thank you for sharing this recipe! My coworkers can’t get enough of it and it’s drawn favorable comparisons to the Starbucks one. :) It’s January and I’m keeping pumpkin season going strong. thanks anissa! so happy you like it. pumpkin season forever! This worked out very well. I did it without a mixer, the bread is moist, not too sweet and very pumpkiny. One question though, your new format for printing doesn’t work for me. Is it just me?